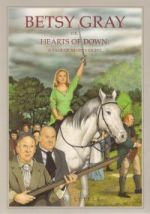 ONE hundred and twenty years since its first publication, W. G. Lyttle's classic novel Betsy Gray or, Hearts of Down is back in print once more. Originally serialised in the North Down Herald in 1885, then later published in book form in 1888, its popularity has proved such that despite numerous subsequent reprints (including three by the Mourne Observer, in 1968, 1978 and 1998, with an added appendix), the book is still very much in demand. It tells the story of the 1798 Rebellion in County Down, when an aggrieved population, largely poor and Presbyterian, took up arms against the Crown, leading to a fierce and bloody conflict which culminated in the Battle of Ballynahinch on 13 June of that year. Central to the plot of Lyttle's story are characters from the area around the Six Road Ends outside Bangor: Mat M'Clenaghan, the blacksmith who forges pike heads at his 'smiddy' in the dead of night; Jamey Dillon, innkeeper and schoolmaster, who doubles as a government spy and informer, and George Gray, the noble-spirited farmer's son and United Irishman, brother of the eponymous heroine, Betsy Gray of Granshaw. Two hundred years after those stirring events of the '98 Rising, the legend of Betsy Gray still refuses to die. To this day arguments rage as to her origins, political significance, and even over her very existence. "Some people claim she came from Killinchy, and others that she never existed a't all," says Derek Rowlinson of Ullans Press, "but Lyttle's case that she was the daughter of Hans Gray, a Granshaw farmer, is the most convincing for me... as for what she symbolises, let people read the book and decide that for themselves." This latest reprint is being produced as the fourth book in a series of Ulster-Scots classics. The Ulster-Scots Language Society, under their imprint of Ullans Press, decided to republish it in order to raise awareness of the linguistic history of County Down. "Apart from being a ripping good yarn, full of intrigue and incident, the book is an excellent way to acquaint yourself with the social history of the area and how folk spoke there not so very long ago, stated Mr Rowlinson. "I think," he continued, "that many coming to the book for the first time will be surprised to learn how truly Scots the language of North Down was." The new edition of Betsy Gray includes the illustrations which first appeared in the sixth edition of 1894, and has a specially commissioned picture for the front cover, depicting Betsy riding towards the Battle of Ballynahinch, dressed in a green silk dress, with sword raised high in hand. There is also an essay by Kenneth Robinson, erstwhile member of the Bangor Historical Society, on W. G. Lyttle and the legend of Betsy Gray, in which he reveals an interesting and long-held misconception regarding Lyttle's name. The book costs £9.99 and is available from Stewart Miller's of Bangor, Newtownards and Holywood, Groomsport Post Office, J & N Charles of Ballynahinch, and the Bookshop at Queen's in Belfast. It is also available online at www.booksulster.com. Alternatively, individual membership of the Ulster-Scots Language Society costs £8 per annum and a complimentary copy will be sent free to all new members joining before the end of January 2009. For membership details ring the Society on 9043 6716 email usls@ulster-scots.com.